Sad news, the inestimable Carol Lloyd is no longer with us, a trailblazer and inspiration to many - as Katie Noonan says: "Carol is like the mother figure of the Brisbane and Queensland music scene," rest well. One of the neatest parts of our Music: Count Us In school music program is writing the song. Talented young songwriters get to work with the best - apply now! Victoria is on a role: from backing live music professionals, to important work addressing sexual harassment and mental health in the arts – tremendous! Are you a musician or music industry professional travelling around Australia? Book your next tour or conference ticket after joining Music Australia. Our members gain access to Virgin Australia’s discount baggage allowances! We also offer 25% discount on our advertising rates, discounts to industry events, 20% off Ukulele Song School products, 20% off tunes at SongLibrary, and lots more.Sign up today! A Songwriting Experience Like No Other! This unique opportunity for young professionals to share their ideas and passion for piano music has been extended due to popular demand. Be quick though, applications close at COB today! The QUBE Effect is back for 2017, providing online and live promotional opportunities for emerging Brisbane musicians. The competition is open to all genres and groups of all sizes with the majority of members aged 12-25 years. Entries are open for the 8th annual John Fries Award for early-career artists from Australia and New Zealand, which provides $10,000 in prize money for the winning artist and $1,000 for each award finalist. The James Morrison Jazz Scholarship is open to solo instrumentalists to further their jazz career The winner will receive $10,000 to assist in the development of their career. The competition calls for filmmakers and musicians to collaborate on a 60 second film. The top ten finalists will be screened at the internationally accredited St Kilda Film Festival. Connect Sydney is an initiative by the City of Sydney which aims to build the capacity of community organisations through the provision of free grant writing training. Ballarat Cabaret will return from October 5 - 8, 2017 and they are looking for the best of Australian Cabaret! This two part panel will delve into the musical history of Victoria’s second biggest city and part two will see APRA AMCOS and Music Victoria offering a unique opportunity to gain insight from the Geelong’s scene’s current creative. Live Music Professionals is a new program targeting independent promoters and venues. The program aims to help individuals in the Victorian music community build sustainable live music businesses. This symposium aims to encourage development of contemporary thought, knowledge and teaching on meter. Meeting Place will be co-hosted by PIAF and AAA, the peak national body for arts and disability. It will provide a platform for learning, discussion and debate on issues impacting artists, arts workers and arts leaders with disability and those with an interest in the arts and disability sector. The festival will include papers, presentations, workshops, panels, lecture recitals, and performances all relating to the subject of music composed, taught and performed by women. The Rock & Roll Writers Festival celebrates the creative relationship between writing and music. Fans of music and writing get up close and personal with the creators of stories and songs. 15 scholarships are now available for young regional artists and cultural workers who wish to pursue professional development opportunities. Scholarships are worth up to $10,000 and include a networking program taking place late next year. Open Space is a one-of-a-kind performance-based collaborative training experience for emerging opera professionals that truly challenges the conventions of opera performance, production, and design. Australian Network for Art and Technology (ANAT) is calling for applications from artists and scientists/researchers for the prestigious Synapse Residency program. The residencies are open to Australian artists working in any discipline and/or medium. The Tasmanian Residencies program supports individual artists, partnerships and collaborations working in any artform to undertake residencies at a variety of locations across Tasmania. Applications are now open for Blacktown City Council Creative Arts Fund. A total of $40,000 worth of grants will be awarded to local individuals and organisations. This is a part time a position for a Level B Lecturer from scholars with teaching and research strengths in creative music therapy. 2RP - Print Radio NSW is looking for a multi-talented generalist, to coordinate and lead their team. Music NT is seeking to appoint a Bush Bands Bash Program Manager. This role is responsible for the coordination of MusicNT’s Bush Bands Project. For more information and to request a position description, email manager@musicnt.com.au. Newtown Entertainment Precinct Association (NEPA) wishes to engage a highly organised and energetic person as Marketing Manager for The Sydney Fringe Festival. This is a service based role supporting writer members of APRA AMCOS with aspects of their membership and royalty collection. An opportunity exists for a Head of Partnerships and Collaborations to join this team in a long term fixed term contract. You will be contributing to the social, economic and cultural value of the Performing Arts Collection and Australian Music Vault. The Queensland Symphony Orchestra (QSO) is holding auditions for Principal first Violin and Section Musician First Violin. Auditions for both positions will be held 10 April 2017. The Auckland Philharmonia Orchestra is inviting Expressions of Interest from outstanding clarinettists for this appointed position available from mid-late 2017. Yamaha Music Australia is running a fundraiser with raffles, a silent auction and live music performed by Cookin’ On 3 Burners, The Badloves, Jacobs Run. Mother’s Ruin is a 60 minute theatrical cabaret featuring our own Maeve Marsden, with music originally performed by Amy Winehouse, Nina Simone, Martha Wainwright, The Popes, The Pretenders and more. Australian rock musician, singer-songwriter and author Dave Graney and The MistLY in concert with special guest Victoria Gaye. Australia’s largest free festival is coming up next month and their recently launched lineup is impressive - Drapht, Emma Louise, Daryl Braithwaite, The Smith Street Band, Archie Roach and Clairy Browne to name a few. 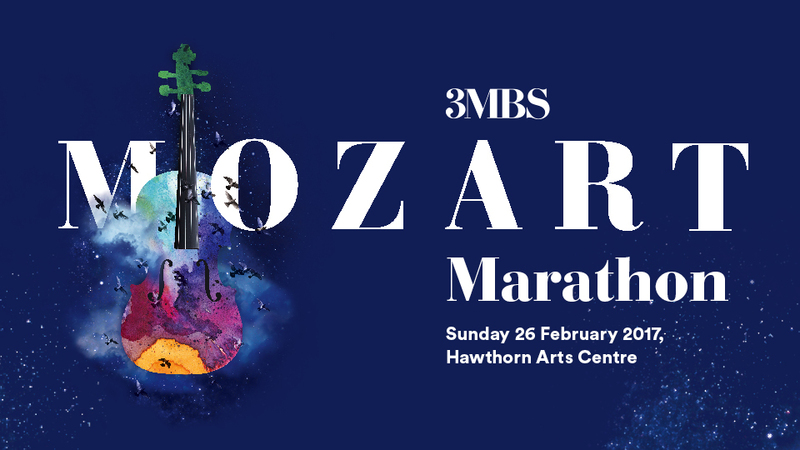 The 3MBS Mozart Marathon is Australia’s largest classical chamber music event, the annual 3MBS music marathon is a highlight on the Melbourne musical calendar. Experience the fascinating transformations that occur when wine and sound combine at the inaugural Australian presentation of Jo Burzynska’s Oenosthesia, sound and wine project.